When some people ask about my religion and, and I mention our traditions, they express surprise because I wasn’t raised in it. Their point is that, if you didn’t grow up in the Faith, speaking of “my people” or “our tradition” seems false or contrived. It has taken me some years to realize that, because they are inundated with fundamentalist ‘messages’ from every megaphone the world offers, they have never grasped the core concepts of actual Christianity. For some religions, ethnicity is everything. The original Hebrew religion is like that. Likewise, for some ethnicities, religious identity is almost assumed – in some Muslim countries for instance. In fact, you could say those twin means of religious-ethnic identity were almost the essence of religion itself, until Christ. What Christ did is not merely teach an ethical life, but actually institute an ethical premise – the concept of conversion as we know it, that is the removal of barriers between people that persist on the basis of differences like ethnicity. The distinctions are preserved, the opposition removed. By rejecting the notion of either a Hebrew religion or a Hellenistic religion (as the Apostle put it, “in Christ there is now neither Jew nor Greek, male nor female”), the original Christians made all converts the full inheritors of all the history and tradition of God’s dealings with man since the beginning, without regard to race or gender. The origins of this attitude are, it seems, not widely understood. One of the damages done by the Protestant creation of Sunday School is that the average American regards chunks of our history as “stories” that have no real significance except something to color while the parents worship. It’s the equivalent of what has happened to historical education in public schools, and for much the same reason. Ask your kid the actual significance of the Versailles Treaty, not what it contained, not what year it took place, but its significance in the history of European affairs. Sunday School. So it’s necessary to observe that Adam was pre-Hebrew and certainly pre-Greek, but as the literal embodiment of mankind had divided himself from his Creator (the beginning of man’s fundamental despair), from his wife through accusation, blame, and suspicion (the beginning of gender conflict), and from the rest of creation through misuse of its bounty – literally it’s fruits (the beginning of natural and ecological catastrophe). Adam rejected any restraint or limitations on his consumption whatsoever, could not even fast from one single tree and then rejected accountability to even his Creator by trying to hide what he’d done and, finally, when challenged, blamed the woman. I find it necessary to say that, in my experience, this is where a lot of eyes glaze over or, in academic circles, bigotry so often prevails. It’s common for antagonists to say “none of this matters, because I don’t think it’s true”. That’s like saying that the Epic of Gilgamesh has no significance whatsoever. It’s the mark not of cleverness, but of a kind of anti-intellectual prejudice for the topic. If one is experiencing simple lack of education in Christian tradition, that’s one thing. If it’s “this doesn’t matter” or “this doesn’t mean anything” it’s actually the preclusion of education – simple bigotry, which is to human attitudes what a fart is to reasoned discussion. If one is interested in the other half of this egg though, it’s necessary to point out that Christ, in the Christian tradition, is “the new Adam” and his mother “the new Eve”. God by becoming man as the New Adam restored as Christ (the Hellene’s word for Messiah) the originate paradise, the union with God, by joining all men to himself (restoring God to man physically and totally by becoming man himself, in the flesh). In doing so, he reversed the aforementioned process of alienation, breaking down the barrier between men and women- evidenced, for instance, by sitting and talking with the woman at the well despite both the cultural taboo and the ethnic one (she was of another race – a Samaritan – rejected by the Hebrews), and by exalting his Mother, our “Champion Leader”, the God-bearer or “Theotokos”, the “earthly Paradise”. Likewise, he set man on a path of compassion, asceticism, peace, and community intended to redeem the whole cosmos that, as the Apostle said, “lies waiting and in pain for the sons of God to show up and be what they are”. The continuity, in other words, between Adam’s Fall and Christ’s Redemption is a core premise of Christian experience. In other words, a core Christian premise is the principle of conversion itself – that religious tradition and genuine belonging to a people is not predicated on ethnicity, or of familial proxy, but instead the true Faith is available to all who essentially break into this inherently historical process of restoration, and we all thereby belong to each other. The gates are thrown open to every man – not to artificially start his own religion like Adam tried to do, which is another act of alienation and what you get with 50,000 Protestant denominations which have neither historical standing nor primordial tradition (being inherently innovative and ahistorical), but rather to have access to the one true Faith, a genuine belonging with a continuity that lies inviolate as the fulfillment of the history of man’s relationship with God. In effect, a person cannot be restored to God, unless he himself participates fully in the full continuity and history of God’s redemption, from Adam, through Moses, and in Christ. It is not an intellectual conversion, nor a mere emotional attitude. Unless we are with the pillar of cloud in the desert, we are not Christians. To miss the mystery of conversion is actually to fail to understand anything of Christianity. In essence, while it is the fullfillment of the Hebrew religion, and all we are Jews in that sense, still venerating She who is our Ark of the New Covenant, and just as we are also all Greeks in Jesus the Hellene (did you know “Jesus” is a Greek name? ), we also all must convert. Even St. Paul the Apostle, faithful Hebrew religionist, still had to convert – he had to participate in the fullness of the redemption from Adam who was no Jew to Christ (“of whom is made of one blood all the nations of the earth”). St. Paul had to be of one Faith even with “Gentiles”. Why do you think we list the geneologies in the Gospels? 1) Because ethnic succession is the form of ‘apostolic’ succession until Christ, so it is necessary to show it just as it is necessary for a priest to show succession all the way back to Christ, today. 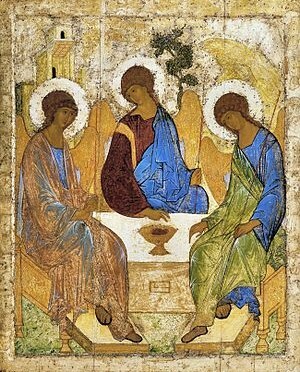 2) Because it is necessary that every people be somehow in some way connected to that lineage, so that literally and physically in the flesh, all nations participate in the body of Christ, though in fact, it is only necessary that Christ be a descendant of Adam, which all people are, which point the geneologies are meant to document. He didn’t arise like a ghost from a swamp somewhere, spontaneously generated, or land in a spaceship as an ‘alien’. In order to redeem us all, in Adam and including Adam, he had to be Adam’s descendant. In that way, when one converts to a mere religious philosophy, one only has to think the right ideas, say the right words, have an emotional connection. Conversion is essentially, for them, a nominal change of allegiance. Protestantism is an example. Buddhism is another. In a religion requiring ethnic pedigree, there is that special requirement. But Christianity – the Christianity of Christ, of the Apostles, of the Fathers, of the Orthodox – conversion to that requires physical and historical participation. After all, you can’t make up your religion – cook your own meth so to speak – you can’t “create” a church – not if you’re of Christ, the actual physical, historical person. Instead, you must locate the actual Church he created, those who maintain the apostolic succession that is not essentially ethnic nor merely hypothetical. It must be the actual Church he created. The only one. That’s Christianity. The versions of “Christianity” one hears on the airwaves and sees on bumperstickers and billboards and gets accosted with outside bus stations is to historical Christianity what KFC is to chicken, to borrow a phrase from Lewis Black. Likewise, it seems to be the prevalent misconception that there’s a “difference” between Greek Orthodox and Russian Orthodox and that somehow the American Orthodox is a made up thing. People’s ideas are bizarre when they don’t really get it. They fill in with all kinds of things. The only reason for an attachment of the appellation “Greek”, “Russian”, “Jerusalem”, “American”, “Antiochian” or whatever to a jurisdiction of the one, singular, undivided Orthodox Church, in which if you commune in any one you may commune in any other, is that our government is structured along the pattern of Roman Imperial government which is broken down into dioceses, etc. You can’t really administer a global reality in any number of languages and cultures if you can’t make some local decisions – not about Faith – that requires the *whole* Church to gather in universal council, and even then they can’t change the Faith itself, only repudiate heresies and heretics and require or repudiate certain practices, or mediate disputes. But you need to be able to fully minister the entirety of the Christian experience to people, regardless of language, nationality, etc. So people on the outside who look and say “oh, they’re individual national religions” really have got it backwards. The very reason they’re speaking different languages is that instead of imposing on them a universal Greek or Latin or some other language, for instance, as Roman Catholicism did, we always simply translated the books into the local language. This is how Cyrillic came about – named for St. Cyril – because when we went to Russia, there was no written language, so we created one, which is why it so greatly resembles Greek. Jesus came as a Hellene – a Greek Jew. The Septuagint, the Greek “Old Testament” was his Scriptures. The first converts were Hellenes. Etc. The idea is not that we force people into some national or ethnic experience, but rather we invite their participation in an inherently human one. It’s always rather amazing to me that people speak of “national” churches as though they were cooked up on the basis of political status, citizenship documentation, or ethnicity – that would be opposite the entire point and, in fact, is specifically a heresy called Phyletism – the escalation of one’s phyla, if you will, to the status of religious consequence. The closest thing to a national Church is either the one-language monoculture approach taken by Roman Catholicism evidenced for instance in converting the Irish by the sword (from Orthodoxy, I might add) and imposing Latin liturgies, or the phenomenon of the “religious right” in the US, which seems to equate Christianity with a particular set of cultural values that correspond to a polarized electorate. I realize some people may take exception with these ideas. Fortunately, I can’t really take credit for them. They’re not primarily ideas – they’re simply a communication of a reality experienced actually and historically by a people, my people, the people of my Faith. They’re not really an opinion – they’re a description. Even in critiquing the West, one must remember that we were the victims of a Crusade by its religion, among other depredations, and the criticisms are borne out of experience too – experience with permanent effects. You don’t have to believe anything I’m saying, naturally. I’ve heard various beliefs to the point of utter boredom. Personally, I’m not interested much in what people believe, and not much of a believer in things myself. People believe in lots of things – some people believe Elvis is still alive. Others believe Egyptians came from lizard people from other planets – though why they should favor converting to Islam, I don’t fully understand. Christianity, the authentic Christianity, isn’t a belief system. That’s religious philosophy – which is why it frames discussion primarily in the form of talking about what one believes. Christianity of the actual kind is primarily historical. It talks mainly about what has happened. It’s a religion of teleological and ascetic experience. It doesn’t need you to concur with it or join it in order to go on being what it is. It doesn’t require you. A belief system on the other hand requires believers, essentially, in order even to exist. If you want that, to be absolutely necessary to something, look for the guy on the corner with the pamphlet. His thing *needs* you in order to keep on being what it is. It talks incessantly of “church growth”, though by “church” it’s referring to a facility for propagation rather than a temple whose priests are still attending the altar as they did in the desert with Moses. An asceticism, by contrast, is more voluntary – it’s not trying to control or convince you. You don’t have to believe, but an educated person should probably make some effort to understand at least something about it. Imagine if the only thing you knew of poetry was a Valentine’s day card you got as a kid in class. That isn’t really poetry, you know. It might rhyme. It might be a nice sentiment. But it’s not what we mean, when we say “poetry”. Not to be critical of everyone that doesn’t get it, but there are quite a few nut jobs too who intentionally level distinctions, because it’s just less work for a mind that can’t cope with the agony of actual thought. If distinctions don’t matter to you – if you’re a person that insists that everything is really everything else, you’re being inconsistent by even reading this. You’re supposed to discovered, eventually, staring off into space, if you’re consistent because, for you, to be catatonic is the same as to be thoughtfully engaged. I’m always amazed by people who claim that the sound of a wheel being off-balance is music, and mush on the bottom of a shoe is art, and religion is religion, but who don’t treat whatever I point at as food, or hard drugs as medicine. Or who say they do, to seem intellectually clever, but who don’t actually live that way. Whatever popular religion is, this isn’t really the same thing as what St. Basil was talking about, or St. Maximus, or St. Seraphim of Sarov. It’s like comparing Thunderbird to wine or instant packets of soup to food or a cardboard box to a house. It’s a sophomoric contrivance, but not a very useful one in actual experience. It is, of course, quite obnoxious when converts engage in ‘convert syndrome’ – immediately, without a pause, becoming evangelists delivering the ‘message’ (an attitude they borrow from popular religion which, as a belief system, can exist for no other reason than to propagate), or going around emphasizing some kind of ethnic caricature (missing the point – while you might have become Orthodox and pray in a Russian Orthodox Church, you’d better be able to walk across the street and also pray in the American one or the Greek one or the Egyptian one or you’ve just re-ethnicized religion in place of Christ’s whole point for showing up). When in Rome, translate it into Italian so the Latins can actually understand what they’re praying. Conversion syndrome can be obnoxious, but it’s understandable, as long as it eventually calms down – people get excited when they step into something larger than themselves alone. But eventually, even in the calm of continuing in the tradition, keeping the calendar, fasting the fasts, feasting the feasts, participating in the sacred Mysteries, liturgizing throughout the full cycle of services in the Christian year, participating in a community way in births, baptisms, marriages, funerals, you begin to take root more and more in something that is increasingly your own in attitude as well as in fact. It really was our God who led us in the pillar through the desert. It was him, it was us, and it was there, and it was. What are we, if we cannot draw on our accumulated history for self-understanding, and for understanding of God’s activity? In short, we would be… a religious philosophy. Inherently ahistorical, rife with a priori assumptions. The other thing to keep in mind, is that we Orthodox speak to our dead. We say that Christ has destroyed the barrier there too. We don’t think of one Church in Heaven and another here. We think of One Church. We think of ourselves as with the dead, and the dead as with us. So of course, we are always, all of us, even those ‘born’ into the Faith (baptized at a much earlier age), are involved in a *process* of conversion, of integration into the community of the many and countless dead who are the eternal living. We are all learning to partake of our tradition, to inherit, in an ongoing way, the wisdom and experience of our ‘ancestors’. None of us says “I am saved” – we all, even if alive to the Faith from the cradle, are *being* saved, and striving to be saved, and expect to keep on striving to be saved until and perhaps beyond the veil of death. But for us, the continuity – the absence, that is, of barriers, is with Adam to whom we yet speak, to our mother Eve, to whom we still pray, to St. Moses, whose prayers we still ask, and so on. Our history and tradition are fundamentally in the people themselves, from whom we are never divided and with whom we are continually one. As the Apostles continually described it, we are “inheritors” of all of that history and tradition. “We who were once not a people, are now a people.” We “have all become one” as Christ prayed for in the last moments before he was taken to face the the lash, the thorns, and the cross. “For there is one Lord, one Faith, one Baptism, one God and Father of all” as we all say. “There are not many Faiths, nor many Baptisms, nor many Gods.” For the historic people of God, the people who all we are, who choose to become one with them in the Faith of the Orthodox, pluralism of religion is polytheism of theology, and ultimately a denial of the union of all men created in the person of Christ in favor of a fundamental alienation of men in differing and incompatible claims of what is real and what is not. For the Christian, there can be only one history and one reality. There’s every manner of cheap progressivist theory and assertion out there of “shouldn’t we all find a way to agree?” but it’s silly. If you’re going to claim that there’s just as much room for the notion that climate is changing as that it is not, or that torture is wrong as that it is not, then you’re not saying anything at all – it is an inherently hypocritical hypothesis, because it pretends to say something, when anything it says must equally accept its contraindication. And no one who isn’t in a mental ward lives that way. It’s an unlivable attitude offered as empty critique, and not an attitude with genuine adherents, not even among the people talking. To walk in front of a bus is the same as not to walk into a bus – natural selection simply kills off people who actually think like that, so they can’t exist – and meanwhile it removes the ground of their argument. So it is with all illogic carried to its logical conclusion – it reduces, inevitably, to the absurd. One doesn’t really have the option to disagree with history, anyway. You’re not entitled to your opinion – you’re entitled to your reasoned opinion, to quote Lewis Black again. Denying things just to deny them is nuts, not thought. Besides, why should one’s goal be for all people to agree, anyway? That presumes that we’re no longer talking about what has happened to us historically, what we experience as a people and a community, and what we participate in by conversion, but rather that there’s a philosophical premise, a belief system (assumptions about philosophical uniformity) which must take precedence, and which we must bring a priori to our experience. That would make us yet another belief system. Beliefs would become, as they are for the Protestant, fundamentally dominant. We must reject that. In this way, non-believers are essentially Protestant (or heterodox), in attitude, even when they have no religious beliefs. They ask us to adopt their belief system their underlying premises, in one form or another, even though many of them claim precisely to not be asking that. It is asked by insisting that we be comprehensible as a mere intellectual construct, or that we be accessible entirely hypothetically, or that we acknowledge the concealed premises that go along with being ‘sensible’ modern men in a pluralistic cultural cacophany. If we really actually meant what we were saying, we of course wouldn’t do that. In fact, we would reject it out of hand, recognizing it as an attempt to substitute propositional psychology for historical identity. And look where that’s gotten the people that do it. A nice, well adjusted, society that doesn’t nuke, exterminate, or torture anyone – right? It’s not that utopias don’t exist (they don’t), it’s that they are inherently hypothetical constructs – thought experiments – not really meant to exist. They are experiments in substituting hypothetical principles for historical reality, which is why utopians never actually create utopias – they merely talk about them – ‘believe’ things related to them. Use a lot of moralistic ‘shoulds’ in regard to them. It’s a form of philosophical fundamentalism. Why would we regard the grass as greener in the world of theoria, of philosophical conjecture and the hypothetical, if we meant what we were saying? For us, we are neither predicated fundamentally on belief, like a philosophy, nor are we choosing beliefs based on expedience (because we prefer some outcome) which is mere invention – fiction – fabrication, but rather we are simply experiencing history that anyone can experience. Fundamentally, if you want one thing we insist upon, it’s reality. We aren’t interested in cooking up things to think. We think according to what happens to us, not a priori, which is why when someone wishes to quote the apostles to us, for instance, we invite them to join the apostles’ church. Otherwise, what’s the point? Theory? But if you read the apostles, that isn’t what they were talking about. To do that to our books is to fail to comprehend. These books were collated for use in the temple, as liturgical instruments by a historical community, not as instruments of theory.